October has arrived and that means one thing: it’s time to dust off your lederhosens and steins because Oktoberfest is here. Offering Sydneysiders an authentic taste of Bavarian beer hall madness, Oktoberfest in the Gardens will take over The Domain in the CBD on October 27th for a day of beer sinking mayhem in the largest beer hall that the country has ever seen. With room for 6,000 other beer lovers, you don’t have to travel all the way to Deutschland to experience the frivolity of the traditional German event. Oktoberfest in the Gardens will transport you to the Bavaria of yesteryear and today, with an overwhelming fusion of brass bands, pretzels, thrill rides, silent discos and … dodgeball. In between sampling the largest variety of German beers on tap that Oktoberfest in the Gardens has ever provided, join forces with four mates and take to the inflatable dodgeball arena. After you defeat the competition celebrate with a boogie at the Silent Disco with 500 other partygoers, dancing to a choice of three different headset stations. 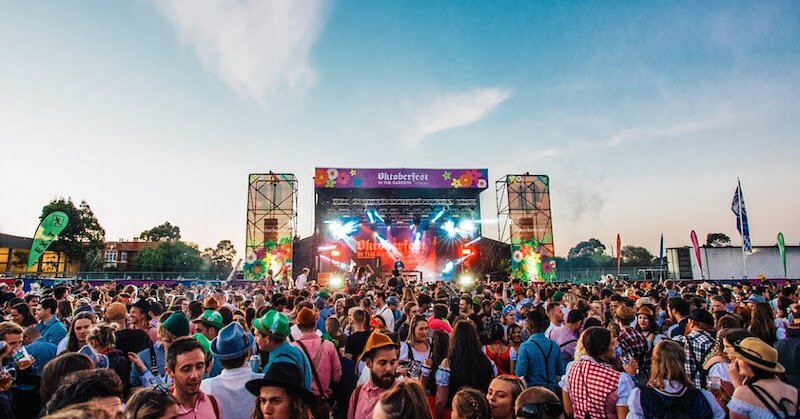 Showcasing some of Sydney’s best DJs and musicians, the two Live and Local stages promise to have every party-tune craving covered. As you make your way through the extensive list of German brews, which includes, Hofbrau, Paulaner, Lowenbrau, Spaten and Steigl, be sure to revel in the greedy wonder of Food Land. Spoilt for choice, chomp away at the diverse selection of German food favourites. Couple your bratwurst, currywurst or kranskis with an equally as mouth-watering schnitzel roll or gourmet slider. After going back for savory seconds, tempt yourself with a sweet apple strudle or crème brulee. With an array of roving entertainers, consisting of yodellers, accordion players and pretzel fräulein there will be nothing left to do but be swept up in the German fun.